We woke up early today so we could catch an early train to New York. We walked the short distance from the hotel to Union Station and caught the 7:31 AM train, which would arrive at Grand Central at 9:07. We really didn’t have any plans, just stroll around midtown really. I didn’t want to take the time to go into any of the boroughs, and while a slice of Lenny’s Pizza in Bensonhurst would have been awesome, I didn’t want to spend 50 minutes each way. 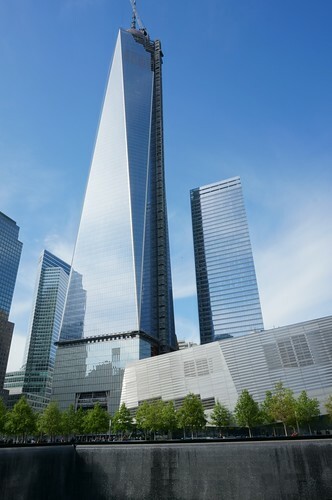 Our farthest destination from midtown would be the 9/11 Memorial at the World Trade center site. 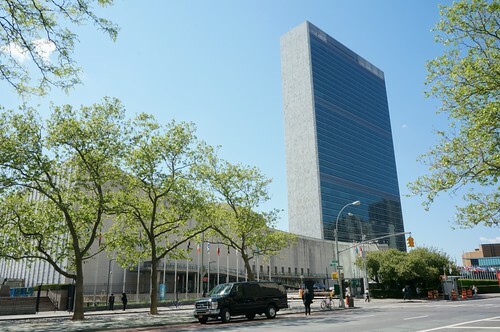 After leaving Grand Central, we walked east on 42nd Street to the United Nations Building. I’d never been there, and I thought I’d snap a few shots to use as filming locations for the Alfred Hitchcock suspense film, North by Northwest, starring Cary Grant. We worked our way back west to 5th Avenue and walked north to FAO Schwarz. Another place I took my daughter to alot when she was a little girl, I was feeling nostalgic when I saw the clock face on the wall, that used to be a clock tower in the entry, and was featured in the 1988 films, “Big” and “Big Business.” I have screen shots from the movie and from a time I was there in 1991 in my Movie Filming Locations post. 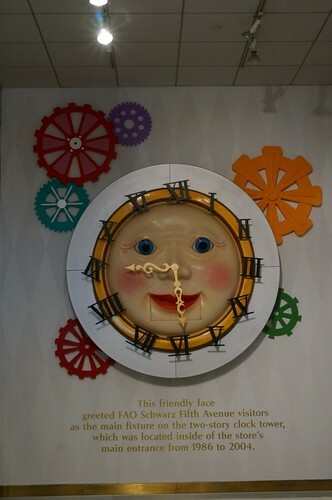 The clock face now sits above an escalator leading to the lower level of the store, and plays the signature song “Welcome to Our World of Toys” every 15 minutes. A few moments of feeling verklempt over hearing the song, I recovered since I have a wonderful grandson now and get to enjoy this sort of thing all over again with him – and watch my daughter enjoy being a mom! 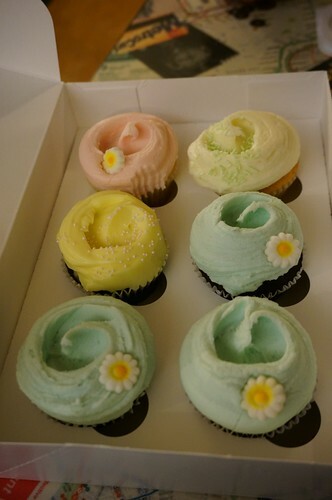 We picked up some sweet treats at the candy shop FAO Schweetz, and continued along our midtown romp. 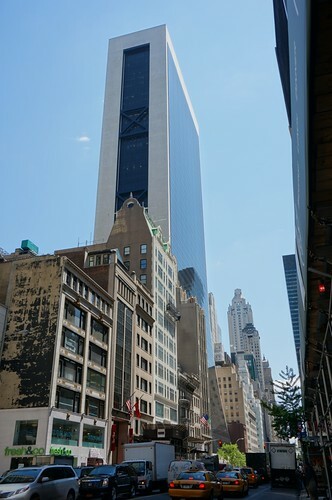 I wanted to take Pat by the Solow Building on 57th Street. I knew he would recognize it from one of our favorite movies, “Lost in America” where Albert Brooks’ character begs for his job back after quitting in a hilarious scene, reeling from the news that he was being transferred from LA to New York, rather than getting the promotion to Vice President that he was expecting. We headed over to Broadway and walked down Broadway to Times Square. I wanted to go to a Disney Store to see if they might have a replica Piston Cup from the Disney/Pixar film “Cars” for Jameson, but none were to be found. Bummer. We did pick up a “Lots-‘o-Huggin'” bear from Toy Story 3, though. With as nice of a day as it was, mid 60’s and dry, lots of people were hanging out in the new (well, about 4 years old) pedestrian plazas in Times Square. 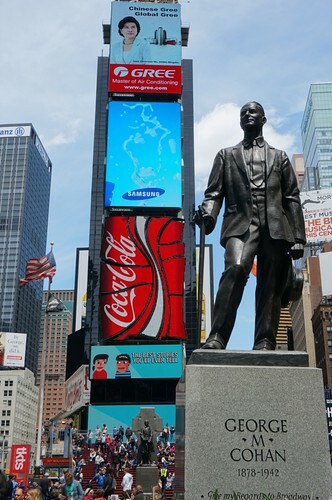 We walked west through Times Square and over toward 44th Street, giving our regards to George M. Cohan along the way. 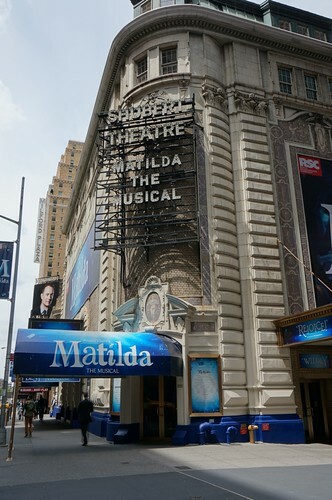 I wanted to take Pat over toward 44th Street to see the Shubert Theatre and Sardi’s. Not technically a filming location, but nonetheless, I will be adding it to my blog for “The Producers,” the 2005 version of Mel Brooks musical, starring Nathan Lane and Matthew Broderick. A set was created that looked just like the area containing the Shubert Theatre, Shubert Alley, and Sardi’s. We walked back toward Broadway & 7th, heading south to about 39th Street until I decided we ought to get down to the 9/11 Memorial. Pat was hoping to meet up with another Pat back in Connecticut, so we took the subway from Times Square to Chambers Street and made the walk of a couple blocks over to the World Trade Center site. We found the Memorial Preview site, where there were displays and information, and we picked up tickets/passes to the memorial. We walked a couple of blocks over to the memorial, and visited the site. 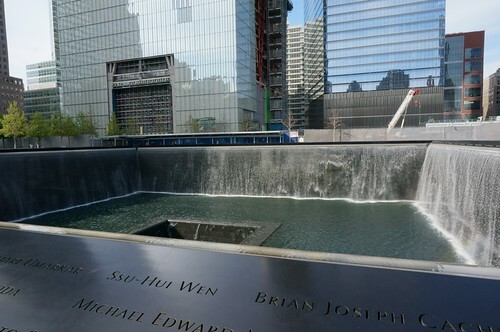 It was solemn and sad to be there, though it was a very nice and tasteful memorial to those everyday people whose ordinary workday turned anything but, as the horror unfolded around them. It shouldn’t ever become something we become desensitized to or forget, not just for the sake of those lost in the tragedy or their families and friends, but for all of us as Americans, whose world also changed forever on that day. Whether it’s extra IDs to open a checking account, to removing shoes, body scans, etc. to new government agencies and terminology, or PC arguments, our daily lives have been affected by the events of 9/11, and we should also mourn the loss of many of our fundamental freedoms. We should go on of course, and enjoy life, but sadly things have changed and not for the better. I hope that everyone who visits is solemn and respectful. They were for the most part, but there we’re a few people there getting their photo taken, smiling away, and I admit, it annoyed me. We headed back up to midtown so we could get going. I suggested to Pat that we cross from Times Square to Grand Central, but Pat was OK sticking around a little longer and walking. 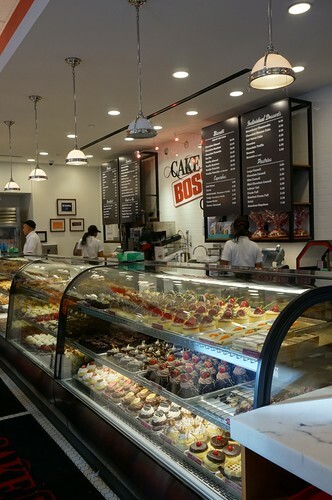 So we went over to the Cake Boss Cafe there to check out the hype. We’d tried to visit Carlo’s Bakery in Hoboken two years ago, but the lines were too long (we had my then-two month old grandson with us). So now we’re at the Cake Boss Cafe, not “Carlo’s” so I wondered if the stuff was made by Carlo’s or is this a product of the television network. It seemed to have a full lined of baked goods. 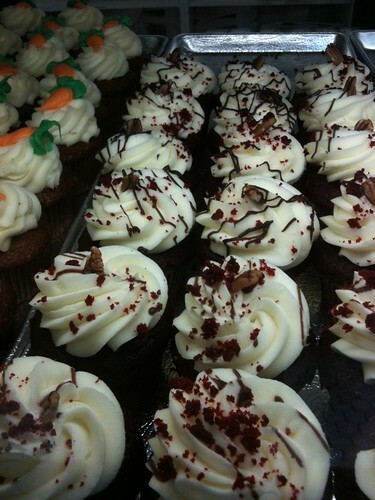 I bought a red velvet cupcake that wasn’t any more expensive than any other specialty cupcake place. It was good but not particularly great. 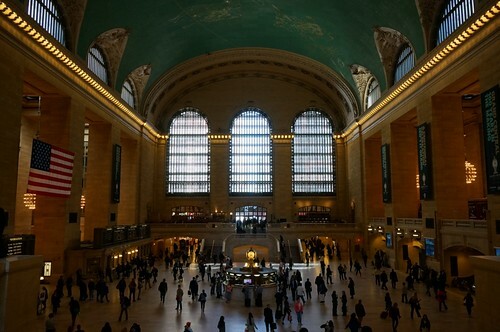 After leaving Grand Central on a New Haven bound Metro North train, I promptly fell asleep. Seriously. I’d been sleep deprived since a week before vacation, which continued right through the night before. I didn’t wake up until a few minutes before we arrived in Milford. We went to the Milford station to meet up with someone Pat met last year, another Pat with the same name. I guess they Googled their name and found each other through Facebook. I was unable to meet the other Pat last year, since I was watching my grandson, so I was able to meet Pat and his fiancee Karen this year. We went to a place in Milford called SBC Brewery. Very good! We had a nice visit and Pat brought us back to the hotel. Still tired from my extended bout of insomnia, it didn’t take long for me to fall asleep! We were going to meet a friend tomorrow morning for coffee, then start following the route I planned that we were going to take before we changed plans. We were still going to take part of it, but in upstate New York, we’d continue west for home rather than loop back to Connecticut. 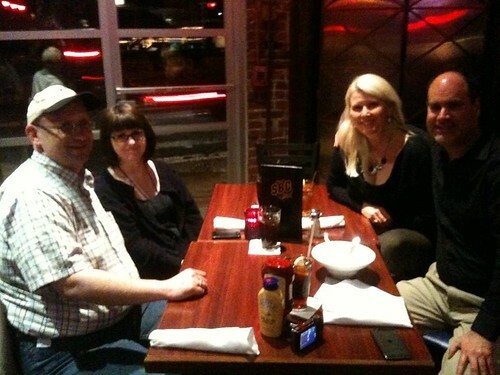 This entry was posted by Jennifer on May 14, 2013 at 10:46 pm, and is filed under Road Trips. Follow any responses to this post through RSS 2.0.You can leave a response or trackback from your own site.